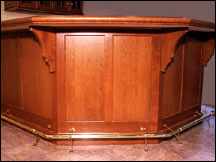 Our Traditional Chicago Bar Rail BR-90 is a top seller. It is in Cherry, HW Maple, Red Oak, Mahogany, Walnut and Poplar. We also have Contemporary Bar Rail BRO2 and BR74 (available only in Red Oak). To finish off your Bar Top, use our Glass Rail Bullnose GRB01 as pictured. For the ultimate in design try our new Radius Bar Rail Corners. Our brass tubing is made of a very durable commercial grade .040 material - this is not your normal thin-walled tubing! Click here to view just a sample of our brass accessories. Looking for something special? Visit our “Designer Series” on Page 30. We can match any profile and we can custom design your profile. Our CNC department can make or match any profile in radius. Factory pre-finishing is available on any order. We are The Source to the Finest Cabinet Shops and the most discriminating homes in America.